Thinking about starting a freelance writing business? Not sure where to start? It’s frightening. I know. But it’s possible. Asking how to break into freelance writing is a bit like asking how to dance. There are so many ways to go about doing it, how to you know which way is the right way? If you want to maximize your success as a freelance writer in as little as time as possible, enroll in my complete course, Write Your Way to Your First $1k. If you’re not sure what works for you – or what’s going to work for you – then start here. Freelance writing encompasses so many options. You have to decide first what path you’re going to take. Remember that as a freelance writer, you’re a business owner (a sole proprietor). What types of services will you offer? The list goes on. If you don’t know what services you’re going to offer apart from “writing,” no one else is going to know what you do and why they should hire you. You can also narrow it down. For instance, if you’re going to write brochures, what industry will you write for? Travel, health, marketing, etc.? You can leave your services broad if you’re open to any project, but you can always narrow your services depending on your skills and background. What types of writing do I like to do? Once you know what you want to write, it’s time to set your rates. The biggest issue many freelance writers run into is deciding how much to charge for freelance writing services. You’re worried that if you charge too high, no one is going to want to hire you. But if you charge too low, you won’t be able to make a living writing. Where do you find that happy medium? What’s a high rate for you may be loose change for your client. But that’s not your problem – nor is it your client’s. The only thing you need to focus on is charging an amount that’ll keep you motivated to do your best work. If that’s $25 for 500 words then by all means, charge $25. Once you’ve committed to a figure, you need to honor it. It doesn’t matter that you now feel you could have charged more because the client accepted your rates without batting an eye. That’s a rabbit-hole you can’t afford to go down because otherwise you’ll resent the work you’re doing and it’ll show in your work. Just because you’re happy with your rates now doesn’t mean you’ll always be. As your skill set will grow, so will your need to earn more. Be smart. Don’t let it get to the point where you resent your rates. Instead, raise your rates every 3 – 6 months even if it’s just by $5. And if you don’t have your rates listed on your writer site, then make sure you always quote slightly higher rates to new clients. Now that we’ve gotten the three rules of setting your freelance writing rates, it’s time to get down to actual numbers. There are three tiers of rates you can charge depending on your experience. Keep in mind that these are the minimum you should be charging. I get it. You’re a new writer, don’t have any experience under your belt, and you’re afraid no one’s going to hire you. Here’s what I suggest you charge if you’re just starting out: $25 for 300-500 words. It’s high enough to discourage scumbag clients who pay $1-$5 for articles but not so high for a small business owner whose business is just starting to take off. If you’ve been blogging for a while and have a few guest posts published and a blog of your own that’s gotten decent social media and comment love – you’re an upcoming writer with some experience. To you, I say, please don’t charge below $50 for 500-750 words. If you’re unsure about charging this much, consider this: There are a ton of blogs out there that pay $50 for guest post submissions. If you’re unsure about charging this much, consider this: There are a ton of blogs out there that pay $50 for guest post submissions. If you’re having trouble finding clients, start guest posting on them. Sophie Lizard has a free report (that woman’s a genius) that lists blogs that pay $50 or more for guest posts. Next, you want to open shop and have your own professional website. The biggest thing you should know right now is that a website is important to your business. It’s not always about using your website and its SEO properties to attract clients. It’s about helping potential clients – no matter how they hear about you – make their final decision to hire you. Your website shows clients you’re serious and you’re professional, but it also gives them a look into your experience and personality. Set up a self-hosted WordPress site. A third-party host will cost you around $4 per month, but you’ll have so much more control over your website, and it will look a lot more professional. If you can’t afford to invest in your business from the get-go, at least spend the $10 or so on a custom domain (such as example.com instead of example.wordpress.com). Make your site about your clients. Lots of novice writers start out talking about themselves. The most effective copy involves talking about clients and telling them how you’re going to solve their problems. In my course I give you effective copy tactics and show you how to write your Hire Me page and About page. If you’re going to have a blog on your site, choose a professional topic. I’ve seen lots of writers add a “Hire Me” page to their personal blog or start a personal blog on their writer website. Chances are clients aren’t looking for you to write personal stories, and they may check out your blog for sample content. Give them a taste of what you can do by keeping your blog professional. 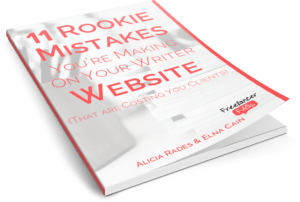 With your writer website up and running, how can you attract clients with it? Unsure what to put on your writer website? Here are six pages your writer website should have and I’ve also included optional pages. It goes without saying that you need home page copy – but right now –writing effective home page content is what you need to focus on. Focus on your client and not about you. Talk about yourself as if your home page is an “about” page. Their website lacks a photo of themselves completely. Their photos is blurry or just a bad shot. Since you’re an individual ­– as opposed to a business entity with employees – it’s a good idea to have a photo of yourself somewhere on your website. It helps clients get a feel for who you are, it makes working with you feel more personal, and it helps brand your business. You don’t have to spend hundreds of dollars on a professional photo session, though. Just be sure you’re taking a photo with a decent camera instead of your web cam, and try to get a good background in the shot. Once you have your photo, the question is where to place it. I always tell writers to put a photo on their home page, but depending on your theme and your copy, you might choose to place it in your sidebar or on your About page. At the very least, it’s worth putting a head shot on your about page so when prospects want to learn more about you, they can put a face to your name. Speaking of an about page, you should have one on your website. The biggest thing you should know is that this page isn’t about you. I’m not saying absolutely everything on your about page must be client-centered. I’ve seen a lot of writers who add a “fun facts” section at the end of their content and that tends to be a fun and effective way to put some more personality into your copy. Your portfolio is what’s going to highlight your experience and prove to prospects you have what it takes to work for them. With access to your portfolio, clients can see what your writing is like and use this to decide whether to hire you or not. But if you don’t have experience yet, don’t fret! You don’t have to have a portfolio to get hired, so just hold off on putting your portfolio page up if you don’t have any clips yet. However, once you do have those clips available, add them to your site! It will contribute to your professional appearance and likely drive more people to hire you. List the titles of your works and link to your article or file. This is perfectly effective, but it can also be aesthetically pleasing to include a related image and perhaps a brief synopsis. Use a portfolio-building tool like WEBPyshiology Portfolio. I know of a lot of other writers who use it. Bonus tip: If you’re writing for print publications, you can upload your samples as PDF documents and then link to them on your portfolio page. Your testimonials section is what’s going to give your prospects trust in your services. If you don’t have any testimonials from previous clients, it’s worth it to get testimonials from past employers or coworkers who can attest to your timeliness, work ethic, etc. Quick tip: Have people leave a testimonial on your LinkedIn profile so that there’s social proof of the testimonial. Then there’s no question about if it’s legitimate or not. Once you have a testimonial or two, create a testimonials tab that showcases these quotes. You can also place testimonials on your home page or in your sidebar. If you’re going to go that route, I’d suggest having both a sidebar widget and a testimonials tab since the tab will be easier to find when prospects are looking for it. Creating a photo of the testimonial. Here’s an example from Kristi Hines. Using a testimonials-building plugin. A popular one is the Client Testimonials plugin for WordPress. Formatting the testimonials inside your post. Taking screen shots of your LinkedIn recommendations. Include a photo of the client whenever possible. It’s more aesthetically pleasing and adds to the credibility. Be sure to include the client’s title (such as CEO of CompanyX) in addition to his/her name. It’s okay to quote only part of the testimonial if the original is a bit long. Optional: Include a link to your client’s website or professional profile. Again, this adds to your credibility. Obviously prospects need a way to contact you or you’ll never get hired! Make it easy for people to contact you by putting your contact information in several places, including your sidebar and footer as well as a contact tab. If one form of communication is better than the others, be sure to mention that on your site. “The best way to contact me is via email,” for example. The elements mentioned above go on my “must-have” list, but there’s more that you can include on your site if you’d like. It can aid in SEO and draw more visitors. It can help you reach your target audience via social media and other channels. It can show clients that your business and site are still active. Each blog post serves as its own portfolio clip. If you choose to have a blog on your website, be sure that it’s professional, and try to focus it toward your target audience. For example, if you want to write for the finance industry, blog about finance since that will draw your target audience to your site. How often do you have to update it? It doesn’t have to be a daily ordeal. You can update your blog bimonthly, and that seems to work for SEO purposes. You can certainly update yours more often if that works for you. Building an email list can be a good way to gather names of potential clients. Some people will say a newsletter subscription form is a must for any website, but I put this in the “optional” category because I don’t think stagnant sites really need a newsletter subscription form. I do think it’s a good choice if you have a blog, however, since your readers are always looking for more content. If you’re going to have a newsletter subscription form, it’s a good idea to offer a free piece of content like a whitepaper or eBook to get people to opt-in. Again, you’ll want to target this toward your ideal client. Many visitors click away from business websites that don’t list rates. You don’t want your site to have the same effect, right? It keeps people with super tight budgets from contacting your and wasting both your time. Some people think rates will scare prospects off, and other people offer such a variety of services that it’s nearly impossible to list an approximate rate without talking with clients first. So that’s really all up to you. I’ve also seen writers include a services tab that digs more into the different type of writing they do. This is usually a good option if you offer more than one type of writing service as it gives clients a better idea of what you can do for them. Now what do you? A big part of your new freelance writing career is marketing your business and promoting your brand. Breaking into freelance writing can be as simple as getting your first client. That obviously depends on a number of factors, including how confident you are in your abilities and how much marketing you’re willing to do. One thing that can get you started is to talk with friends and friends of friends to see if anyone you know needs a writer. You can also contact local businesses in the area that may be in need of marketing material or website copy. Otherwise, job boards and other freelance writing contacts (through referrals) can be good places to find your first clients. You might even find an “in” with publications you frequent if they accept contributors. Simply being one of their loyal readers is a plus since you already understand their tone and values. It’s true that if you don’t know what you’re doing, it can take some time to land that first client. But with some help (my freelance writing course has helped many people form a plan and land their first client in the shortest amount of time possible) and persistence, you’ll be able to land that client and more. Granted, these are all good things to have, but there are a ton of writers who have built up a career without any of this. Higher quality content is a must in today’s market – it’s not impossible to break in if you’re determined. The experience and clips will come with time. If clients won’t hire you because you don’t have clips or testimonials, it can be worth contributing to a well-known publication for free as a portfolio builder. Set your rates, and stick to them. As a novice writer, it’s tough to know what to charge. Just remember: minimum wage as a freelancer is a lot less than minimum wage as an employee since you’ll have non-billable hours and you don’t get benefits in addition to your paycheck. Make sure you have a service agreement and a client questionnaire. Your questionnaire will help you get a feel for what a client is looking for, and your contract will protect both of you in detailing payment, ownership of content, etc. While you’re probably tempted to start at content mills–a company that produces a huge amount of copy for crap pay–it’s best to steer clear of them. However, like I said, do what works for you. There are a lot of freelancers who still frequent places like Upwork because, even though the good jobs are few and far between, there are still some good-paying opportunities there. Again, do what works for you, but it’s always a good practice to look for alternative forms of income over content mills or you’ll never escape them and make a living wage as a freelance writer. It’s a lot to take in right? 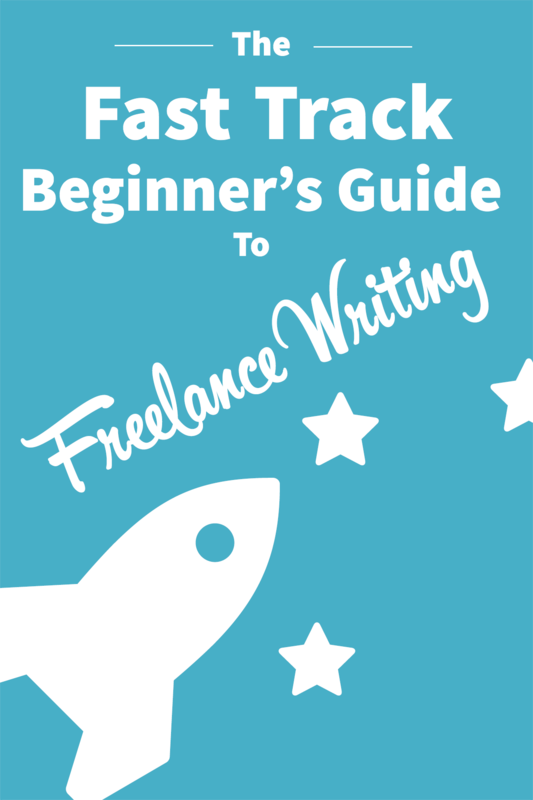 This quick guide only touches on the surface of what you absolutely need to start freelance writing. And you can totally get started with what we outlined here in this guide. But, if you’re looking for a complete course that walks you through every step of the process, enroll in my course Write Your Way to Your First $1k today! Hi Elna, absolutely amazing post with all details. I’ll be honest. I am never sure how much to charge as English is not my mother tongue but I know you always encourage writers not to underestimate themselves. Thank you! Thanks for coming over her too. I’ve seen you everywhere online…ha! As for charging, as long as you can convey you have a strong understanding of using the English language you can charge what you like. If you don’t have many sample, you could start at $.06/word to $.10/word and move on up from there! This is true. I know of quite a few writers who make either good money or an absolute killing, and English isn’t even their first language! Knowing that definitely inspires me since I’m as English as you get. Awesome post Elna, Alicia and Samar! This is such an awesome blog post, especially for those just starting out! I had always wondered what to charge as a new freelance writer. Now I have a base figure to give clients when I’m pitching to them. So thanks for that, guys! You cleared up so much for me and I’ve been a freelancer for almost a year now! Hello! Thanks so much for writing this amazingly helpful piece, but I have a few questions that I was hoping you could answer. Before I ask my questions, you should know that I am under 18, and that I am considering freelance writing as a part-time job. If I don’t have any previous professional or commercial writing experience (or any job experience at all), how can I get references? Could I get one from my English teacher? Do you think that it is even possible for me to make money as a freelance writer? Any extra information would be really helpful, thanks!